In July, Tim attended a workshop to learn the EcoNest style of clay/fibre building. The thick walls made of clay, straw, and wood chips offer an excellent combination of insulation and thermal mass. The clay/fibre walls are comprised of a mixture that is packed into wooden forms, then allowed to dry and solidify over a number of weeks before having a finish plaster applied. In this course, taught by Robert Laporte, co-founder of the EcoNest building company, the walls were framed with a series of Larsen trusses. A Larsen Truss is built with two parallel lengths of dimensional 2″ x 4″ lumber joined by strips of plywood. These trusses become the “studs” of the wall. 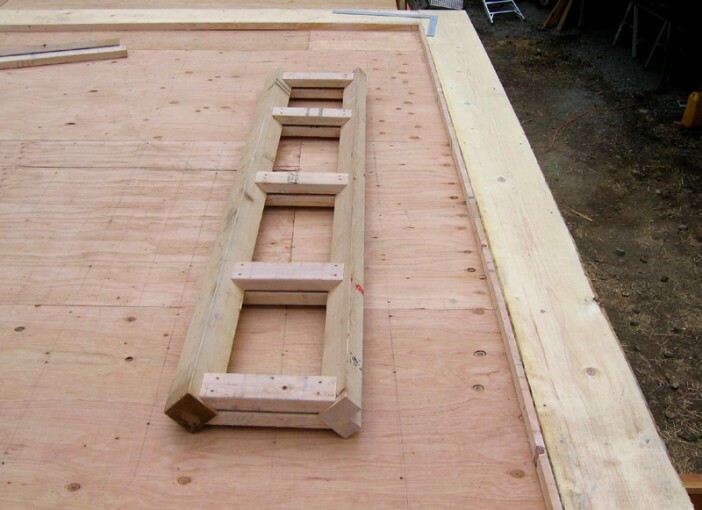 This photo shows a corner truss, which uses 4″ x 4″ lumber joined by strips of 2″ x 4″ lumber. There is a rabbet cut into the 4″ x 4″ that will be on the interior face of the wall (right side in this photo). When the two adjoining walls attach to the corner truss, the rabbet will form the interior corner. For more information on Robert Laporte, visit the EcoNest Building Company.